Aeropress Coffee - here we go. The look and feel and touch of the Aeropress, I have to say, is not most attractive; however, does make impressively good and tasty coffee. 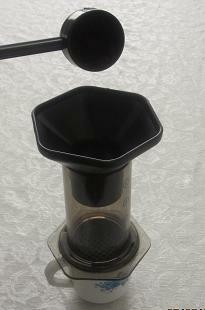 It works similar to a french press, with notable differences, though, as I'll point out further below. The Aeropress is essentially a coffee plunger. Take the plastic cap off the chamber, place your small Aeropress paper filter into it (you get a couple of hundreds when you buy the press), twist the cap back on the chamber, place the brew chamber on a mug (the Aeropress does NOT include a mug). Next, scoop in your coffee -- 1 scoop per 6 oz of water -- add the hot freshly heated water, stir with the included plastic stirrer, then place the plunger on top of the brew chamber and press down with slow and stead pressure. The Aeropress, like the french press, is manually operated. Grounds are mixed and stirred with the HOT water for richer coffee, better extraction and less acidity. No machine coffee. No motor-malfunctions. Aero press coffee is much quicker than the french press, and although using a paper filter (absorbing some of the oils and possibly adding a paper taste if you don't rinse it before), it is much smoother and "cleaner" than the french press. The brew process takes less than a minute with the Aero-press, while the steeping of french press alone takes 3-4 minutes. The Aeropress is plunged just after 10 seconds of steeping and 10 seconds of stirring. Unlike the french press that uses coarse grounds, I recommend a more finer ground -- not too fine! -- for the Aeropress. A medium ground should be well. The Aeropress, as opposed to the frenchpress, doesn't let through grounds into the cup. The Aeropress is also very easy to clean. Just take off the filter cab, toss the paper with the used grounds to the bin, and quickly rinse the rubber seal of the plunger part; that's it, quick and easy. Easy use - add coffee and water and press down, that's it. Hang on there. I'll be back shortly and add step by step aeropress how to instructions and pictures. I should have an Aeropress instructions video uploaded soon as well. Additionally, Aeropress-coffee questions and answers are coming soon. Another topic about the Aeropress I would like to address soon is the inverse Aeropresss method. Meanwhile, why not add your 2 cents on the Aeropresscoffee maker. Kindly add your comments below and don't forget to upload your own Aeropress photos and videos! Add Your Aerobie Aeropress Coffee, Comments, Photos and Videos!